Ever thought that Weezer could use your songwriting magic? Your shot at stardom could be at hand: Weezer have just announced their Love Is The Answer remix contest, and the grand prize winner will have to opportunity to participate in a one-on-one collaboration with Rivers Cuomo via Indaba Music. Launched today (10 February), there will be a four-week submission period and a two-week voting period. Weezer, an A&R executive from Interscope/Geffen and Indaba Music will also hand-pick the top remixes from the semi-finalists for a commercial release, and the artists will be paid appropriate royalties for their contributions. 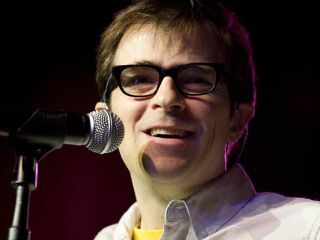 "The idea here is people do their own version of our song based on the music they are into," said Weezer's Pat Wilson. "Hopefully we will get versions of the song in other languages, and in a bunch of different musical styles. It would be great if people got inspired to try new things and are really creative. "The other part of this contest that is cool is a bunch of these remixes will get officially released and the people that worked on it will get paid their royalties for being on the compilation." Not to mention a chance to work on a brand-new song with Rivers. Who knows? You could come up with the next Undone - The Sweater Song, or the next Buddy Holly. To get your hands on the original tracks and have your way with Weezer's Love Is The Answer, click here.